By some great misfortune, I feel the cold very deeply. Simply going outside for a few minutes (or, in extreme cases, staying inside but making the mistake of not wearing a sweater) can give me a chill for hours. So it is not too peculiar that I have been quite cold during the past few months! Canada, especially my part of it, is never warm in wintertime, and this winter has been both unusually cold and unfairly long. But the biting cold has an upside- like many other small and seemingly inconsequential things in my life, it reminds me of World War II and the Eastern Front. Late last evening while walking my dog in the -30° C cold, I could not help but think of how horrible the winters of Russia must have been for soldiers of all nationalities seventy years ago. Although they do not make me like the cold any better, such reminders help me to appreciate all that soldiers endured; in addition, if so many survived the Russian winter and the stresses of combat, then surely I can hold out until spring! It is an indisputable fact that the strength of the Red Army was not the only thing underestimated by Adolf Hitler- he also underestimated the severity of the Russian winter. The significant German gains of June and July became a distant memory as the snow began to fall, slowing the invaders’ advance and giving the defenders some much-needed hope. Accounts of the freezing temperatures vary, but the temperatures seemed to have ranged in November and December from about -10° C to -35° or even -40°. 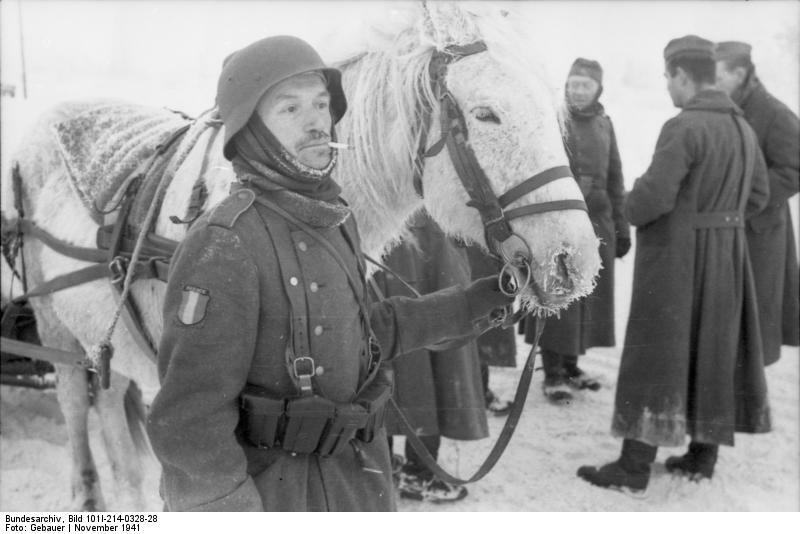 Such cold was painful even for the well-acclimatized Soviet troops, but for the Germans it was a cold, frozen hell. 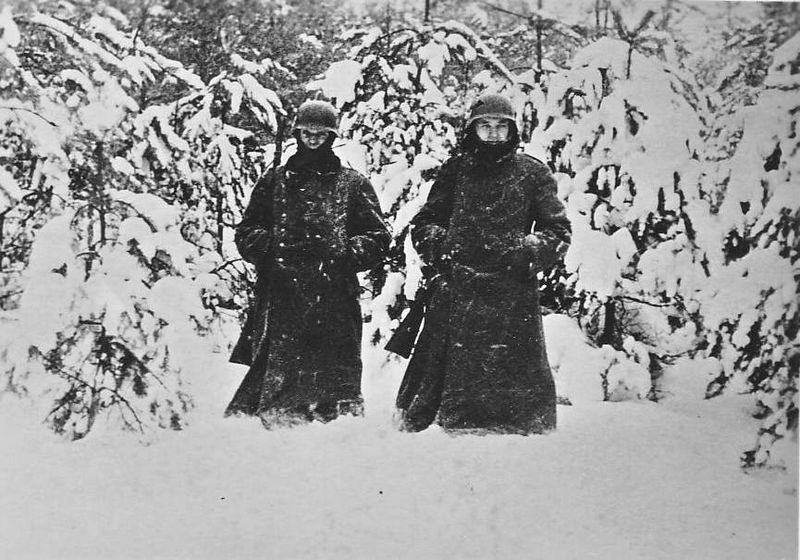 Photo of Germans in snow near Moscow: from Wikimedia Commons. Attributed to Wilhelm Gierse. 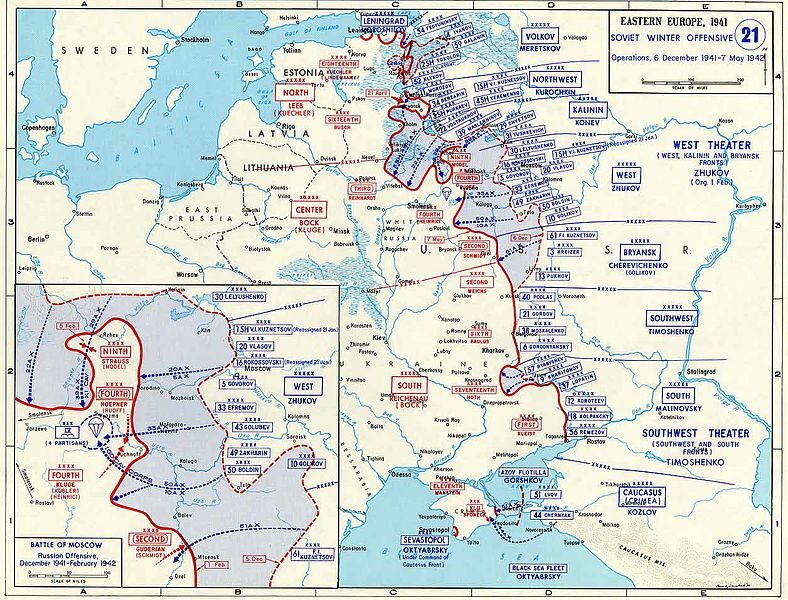 No one in Wehrmacht command had prepared for such temperatures; indeed, many had believed in the early days of the invasion that Russia would be finished within two weeks. Winter, in the optimistic heat of late June, was not on anyone’s mind. As a result, preparation for colder temperatures was nonexistent, and the German soldiers paid a heavy price for their leaders’ arrogance and oversight. Records show that 130,000 cases of frostbite occurred among the Wehrmacht troops involved in the Battle of Moscow, and just before Christmas Joseph Goebbels (Hitler’s chief of propaganda) sent out an appeal for donations of warm clothing to the German nation. The need was evident to all levels of command; Heinz Guderian, the famous Panzer commander, wrote in his journal that it was fortunate he had stopped his troops in early December, “otherwise the catastrophe would have been unavoidable”. But the greater catastrophe was unavoidable, and the Soviets drove the Germans back from the environs of Moscow on January 7, 1942. Photo of Soviet winter counter-offensive: from Wikimedia Commons. Attributed to unknown employee of the United States Government. The adverse effect of such severe cold on warfare in the 1940s, and indeed even today, cannot be understated. Bare skin freezes to metal in the cold, and the bolts of rifles are liable to freeze and become inoperable. Grease freezes and lubricants thicken, making machinery unusable. Vehicles must warm up for inconveniently long periods of time, and roads are often impassable after a heavy snowfall. But what is more, any prolonged exposure to cold is a mental hurdle as well. I find that being cold gets into one’s mind and becomes a consuming distraction- much like a fierce hunger, the discomfort of cold distracts one from other matters and causes much suffering and frustration. As previously mentioned, German troops facing their first Russian winter were painfully ill-prepared. Many men took to wearing their drill fatigues over their uniforms in an attempt to stay warm, and even padded their clothes with paper. 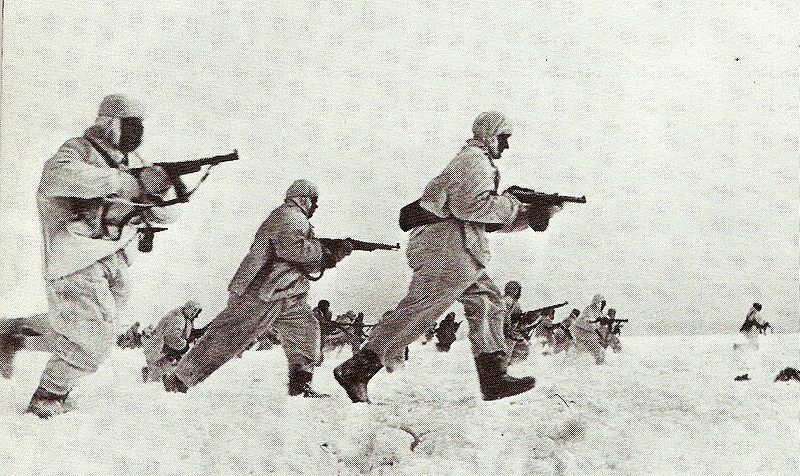 Soviet troops, on the other hand, were well ready for their bitter winter. 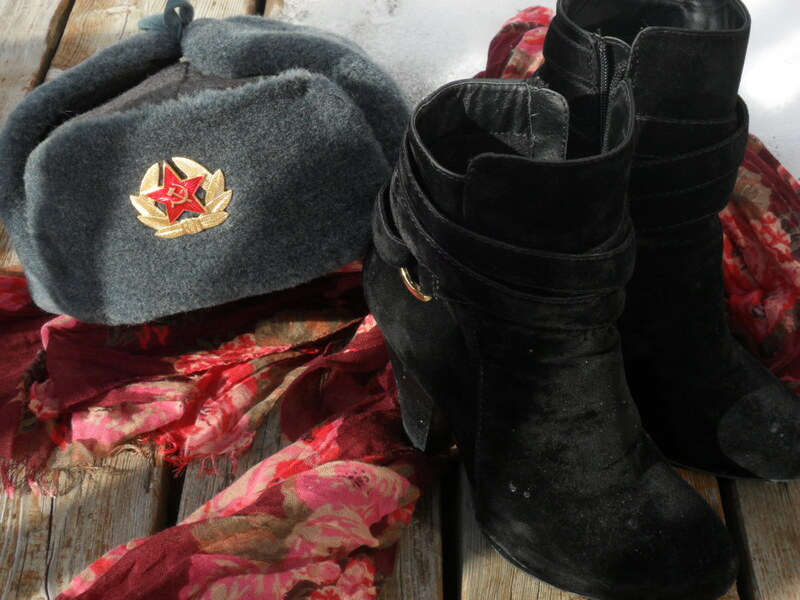 Compressed felt boots called valenki were issued, as well as warm hats called ushanki, which were made out of a strange synthetic material known as “fish-fur”. I can speak from experience and say that ushanki are wonderfully warm, and very practical, pieces of headgear! Padded clothing was also issued, and snipers were given special mitts with an uninsulated trigger finger. Many Soviet troops had grown up in close proximity to nature, and were used to hunting or working outdoors year-round. Thus, fighting in the merciless winter was not too foreign to them, although the climate of Russia is notoriously cold- winters around Moscow can see temperatures from -10° C to -30°. Conversely, the Germans- coming as they did from a smaller and more developed country where the average wintertime temperature is not too far below 0° C- were not as used to being outside or to being in a frigid climate. In contrast to Hitler’s leadership, Soviet command prepared shrewdly for the winter, organizing ski battalions which found it easy to navigate through the snowy expanses of western Russia. Such ski battalions had actually been used to great effect against Soviet forces in the Winter War with Finland, and they had similar success against the beleaguered Germans in 1941. Also, the cold temperatures and snowy landscapes were better suited to defensive battles, favouring the Soviets and making it hard for the Germans to gain ground. Photo of Soviet troops in winter camouflage: from Wikimedia Commons. Attributed to unknown author. Ultimately, the unrelenting winter of Russia played a huge part in stopping the Germans short of Moscow. Coupled with the dogged defence of the Soviet troops, it humbled a once-arrogant army and handed the Wehrmacht its first taste of defeat. But this post is not meant to dwell on the results of the Battle of Moscow. Instead, I wished to focus on the struggle itself, and all the frigid hardships endured by the soldiers of both the Wehrmacht and the Red Army. This monumental struggle defined the Great Patriotic War, and must have been a true terror for all involved. Fowler, W. (2004). Barbarossa: The First 7 Days. Havertown, PA: Casemate. Bethell, N. (1977). Russia Besieged. Alexandria, VA: Time-Life Books. There is no era in fashion that I love more than the 1940s. Military styling appeals to me immensely, and I adore the juxtaposition of masculine, military-inspired tailoring and ladylike accessories and hairstyles prevalent in ’40s style. The following Polyvore set represents what I believe is the best of this fashionable era: sharp, tailored separates, restrained and tasteful accessories, and prominent touches of feminine charm. Britain is a subject that is never far from my mind. I often feel more British than I do Canadian, and I love every eccentricity and memorable feature of Great Britain. I have been very blessed to have visited England and Wales many times, and as a result there are numerous things which remind me of Britain, even when I am not there. Starbucks is one of the most evocative things to me. Although it is certainly not a British invention, the first Starbucks coffee I had was from a shop on Kensington High Street in July 2009, so it never ceases to remind me of London. On weekends here at home, I often visit the local Starbucks for a coffee or cappuccino. Both beverages bring chilly grey English mornings to mind, and make me feel as if I am there again. Grey skies also remind me of Britain. But, unfortunately, grey skies in Britain are more beautiful than grey skies anywhere else, so a lack of sunshine in Canada makes me feel a little wistful. Wales comes to mind whenever a lot of fog and low cloud is about- refer to my earlier post My Best Days in Britain: Part One for more on that! 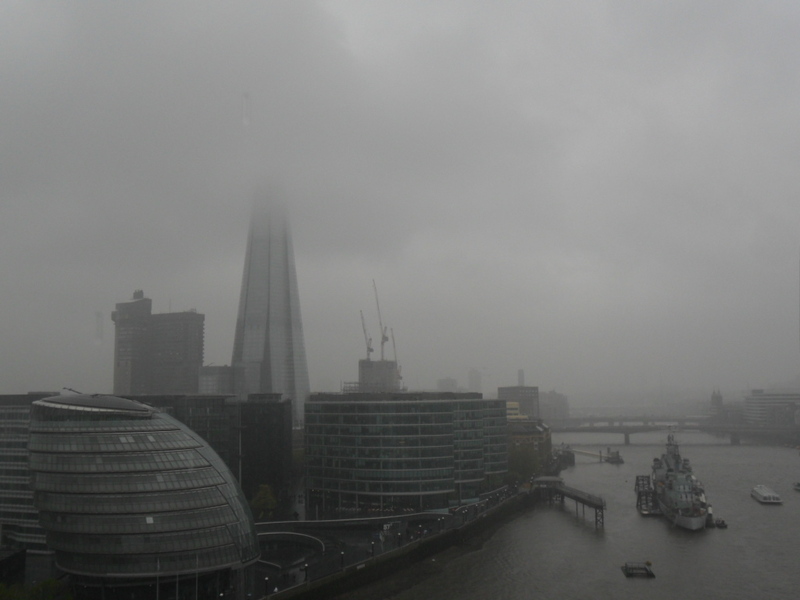 London City Hall, The Shard, and HMS Belfast seen through the rain, from Tower Bridge, in May 2012. Watching football (proper football- not American, Superbowl stuff!) gives me great excitement, and must be of the most British things in existence. Every Saturday morning, after sleeping in for an extra hour or so, I watch Premier League football while eating my breakfast. It is a time of contented relaxation, and reminds me of how many football shirts and adverts I have seen while in Britain. Arsenal is my team, although I also like Swansea and Cardiff due to my Welsh heritage! Something that I have done a lot of in England is shopping- from the high street chains like TK Maxx and Dorothy Perkins to Selfridges in central London, shopping in Britain is an experience in itself. It must be said that London is a fashion capital, and it always delights me to find London-born trends in the shops at home! 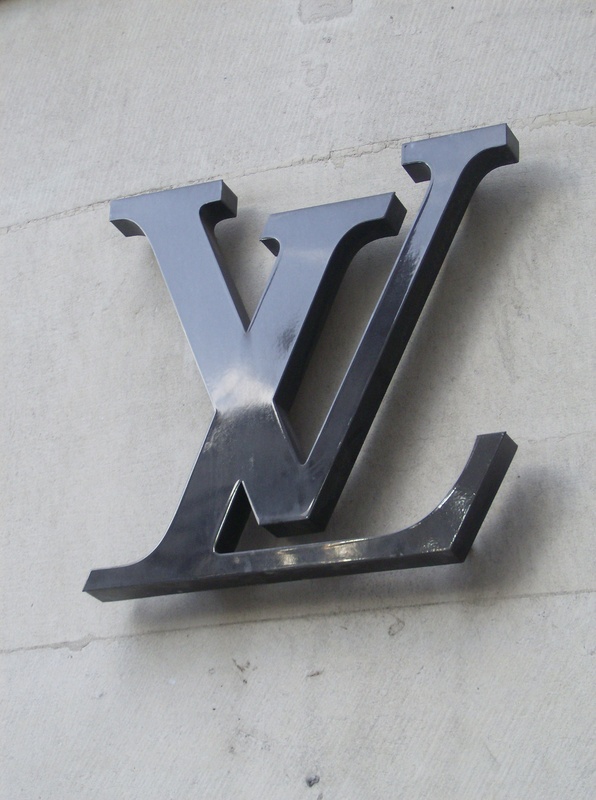 Louis Vuitton logo on outside of shop near Leadenhall Market. Expensive, yet tasteful, motors are a hallmark of Britain for me. I have seen incredible things on the roads of Britain, such as a fabulous bright blue McLaren MP4-12C near Shrewsbury, a Phantom Drophead Coupe on Baker Street, and an original Ford GT40 parked outside a Sussex pub. One cannot go a day in London, especially, without seeing a dozen Bentleys, several Aston Martins, and probably a Ferrari or two. Elegant and powerful cars are a part of British history, and they remain a fact of life today. The affluence and atmosphere in Canada are not the same as that of central London, but the sight of any exclusive luxury car still takes me back to the streets of Britain. 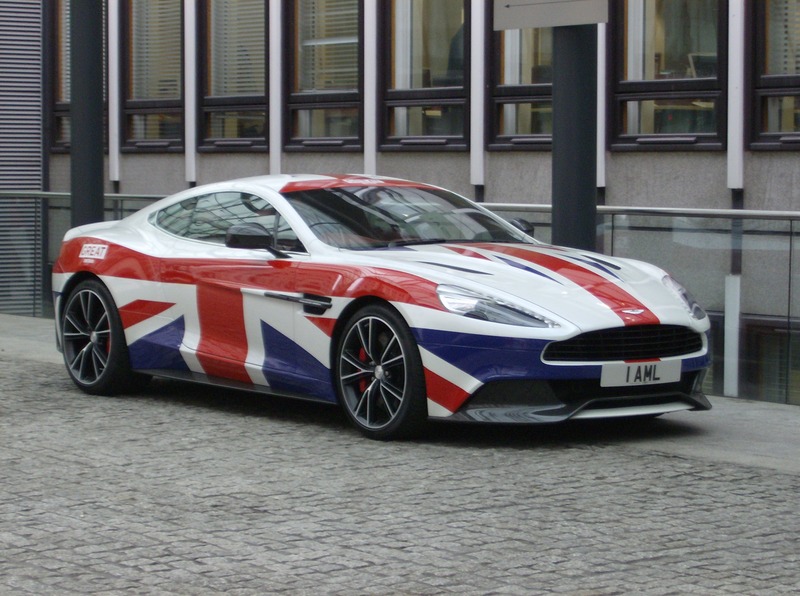 Patriotic and perfect in every way- gorgeous Aston Martin in Union flag livery. Finally, a pint of British ale never fails to evoke memories of the homeland. Of course, nothing beats a pint from the taps in a real English pub, but I still enjoy authentic beers at home. Fuller’s London Pride, Guinness, and Lancaster Bomber are a few of my favourites, although in the summertime Pimm’s with lemonade is refreshing and wonderful. In addition, pub grub is a comforting and happy reminder of Britain. Lovely, golden, thick-cut chips drowned in vinegar and ketchup are probably my favourite food of all time, but somehow everything tastes better in the cosy environs of a good English pub! 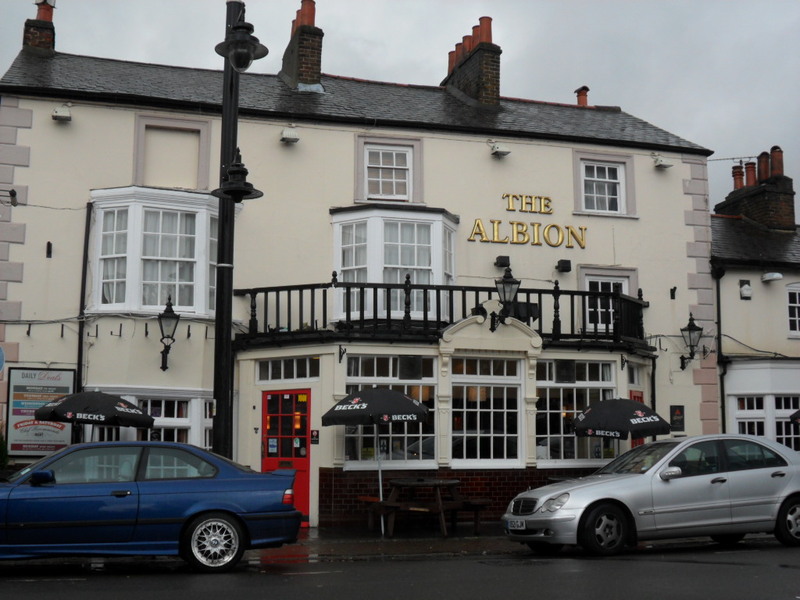 The Albion near Hampton Court Palace- my favourite Greater London pub. As you may now realize, my life is full of things that remind me of Britain. I have so many fond memories of my time there, and so many things to appreciate when I inevitably visit again. Most of the time, I greatly miss this amazing nation of which I am a member; but thanks to these vivid memories, I never feel too far away. I have never been an exceptionally adventurous individual, preferring instead comfortable and familiar things. Even now, after nearly two decades of life, I dislike anything that I am not prepared for, and the uncertain can be cause for great anxiety. However, the past few years have seen me try several extremely adventurous things, and I feel that by moving out of my comfort zone I am coming into my element. Since 2011, I have discovered numerous new hobbies and pastimes, which have given me the basis for a great and exciting bucket list. Most of this list- as I now realize- involves either very expensive or exclusive things, and a recurring theme is the military- but what is a bucket list, if it is not something to strive for and dream of? Ever since I began playing Medal of Honor: Airborne back in 2009, I have wanted to jump out of a C-47. I don’t simply want to skydive; the plane has to be a C-47. I imagine that being a paratrooper would be quite terrifying, and it would be fascinating to experience a bit of what they went through. 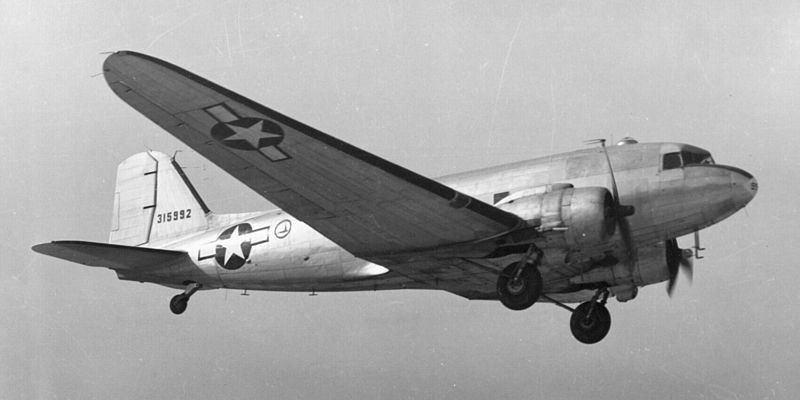 Photo of Douglas C-47 Skytrain: from Wikimedia Commons. Attributed to unknown author. I see a lot of C-130s in the skies around my house, so I have a great appreciation for this beautiful and utilitarian aircraft. And High Altitude Low Opening jumps, for some strange reason, are quite appealing to me- I think it would be amazing to fall so fast for so long, and to be able to look around at the landscape below. 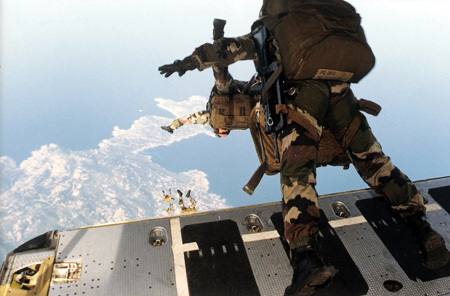 Photo of parachutists on HALO jump: from Wikimedia Commons. Attributed to Davric. 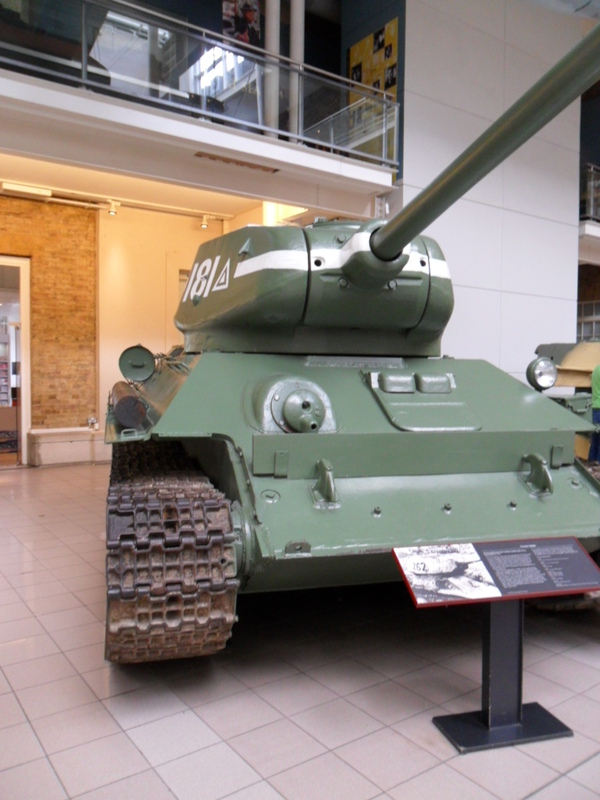 The T-34 is a legend of the Eastern Front, and I have been obsessed with these tanks for several years. I have nothing but admiration for the T-34 tank- it is a magnificent piece of engineering and is, in my opinion, the best tank of WWII. T-34s were apparently quite difficult to drive, especially in the early days, and driving one is something that not many people have done. It also doesn’t hurt, of course, that the main characters in the novel I’m currently writing are members of a T-34 crew! My dream trip would be one to all major WWII sites in Europe and Russia- the fjords of Norway where the German battleship Tirpitz was moored, the Ardennes, the Atlantic Wall and D-Day beaches in Normandy, Smolensk, Kursk, and especially Stalingrad (now Volgograd), to name a few. It would be a very emotional experience for me to see such locales, and I hope very much that someday this will become a reality! In addition, someday I hope to attend both the Victory Day and November Red Army parades in Moscow’s Red Square. Russia is so proud of her soldiers’ sacrifices in WWII, and seeing these parades would be a memorable and touching experience. Photo of Beny-sur-Mer Canadian War Cemetery: from Wikimedia Commons. Attributed to Burtonpe. Ice hockey is a massive part of my life- many of my most wonderful blessings have come about because of hockey. I am a goalie and have played for almost eight years; facts which have not contributed to the wellbeing of my knees! But I would never choose to give up playing hockey, and I hope to continue playing for many decades! This may be very unlikely indeed, since civilians are never allowed to own suitably high-tech military equipment, but I still have hope. Flying is one of my greatest passions, and I deeply appreciate the incredible capabilities of modern, and recently retired, fighter jets. I have an idea of which aircraft I would most like to fly in, although I can’t narrow it down to just one! The BAE Harrier is an obvious choice, due to its revolutionary VTOL capabilities. But I also love the Sukhoi Su-27 Flanker, with its enviable manoeuvrability, impressive speed, and elegant looks. Although I have these two planes in mind, in reality any supersonic aircraft would provide more than enough excitement, and all military aircraft give me the same sense of awe and wonder. 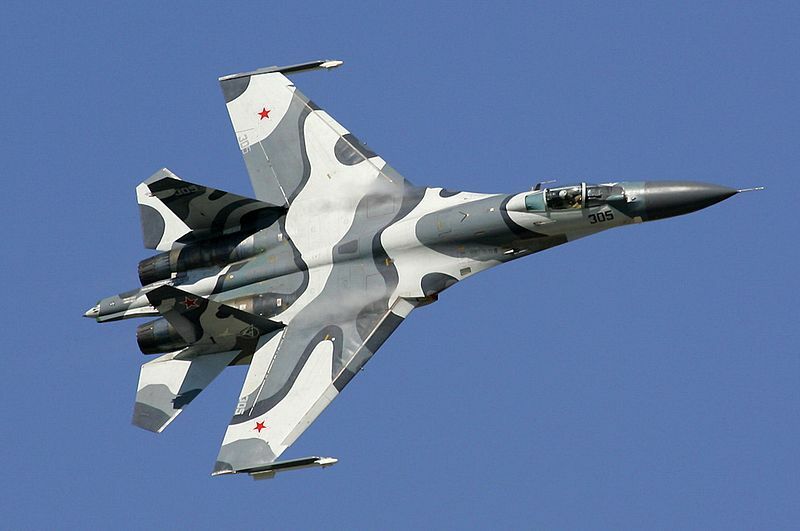 Photo of Su-27 Flanker: from http://www.airliners.net/photo/Russia—Air/Sukhoi-Su-27SKM/101428/L/ via Wikimedia Commons. Attributed to Dmitriy Pichugin. In 2005, when I was 11, a small stuffed orangutan named Pongo came into my life, and ever since then I have been very concerned about the welfare of primates and the destruction of the world’s rainforests. It remains a wish of mine to visit an orangutan sanctuary someday, to marvel at these amazing animals in their near-natural habitat. Unfortunately, this may be the most impossible of all my bucket list dreams, given the distressing state of the Borneo rainforest and the eagerness of humanity to destroy the things that it is entrusted to care for. I have a strong ambition when it comes to writing. Writing a bestselling novel would be a fantastic achievement, one that is almost too great to fathom. But my reasons for wanting this are not wholly selfish- although money would certainly be nice, I have no wish to be famous, and instead my goal is to educate and inspire people with my work. Especially when it comes to WWII, my subject of choice, I strive to enlighten people about subjects they might not know and possibilities they might not have imagined. Fortunately, WWII is a subject which offers me many such opportunities, from the Soviet Union’s role in the conflict to the contribution of women to the war effort. I feel that WWII, as well as other conflicts, is often only remembered on Remembrance Day, and I hope that my writing will encourage people to consider it with more regularity. I now realize that this is not even my entire bucket list- there are so many things that I am excited about and want to do in my lifetime. And I may never manage any of the things I’ve just written about, but at least the dream is there. Perhaps there will be a Bucket List 2.0 post sometime in the future, but for now, I hope you enjoyed this one! Unlikely though it may seem given the unrelenting Arctic temperatures of late, February 16 in Barrie, Ontario has actually been a beautifully sunny day. It is almost enough to make me feel optimistic that summer is coming, and that the next Ice Age has not decided to come early. So it is with no hesitation that I post this Polyvore set- a charming 1940s style beach outfit. Perhaps, by July or maybe June, the temperatures will have caught up to the sunshine and the beleaguered inhabitants of North America will be able to enjoy a day at the beach! It bothers me to know that the majority of American citizens views Russia as an unfriendly nation. But according to a recently conducted Gallup poll, 60% of American adults view Russia in an unfavourable light. In my opinion, this is deeply unfortunate and also a very negative influence in international affairs. The 1991 dissolution of the Soviet Union was difficult for many Russians to accept, but it also presented the rest of the world with a brilliant opportunity. Gone was the old, hard-line Soviet leadership with its isolationist principles and its distaste for all things Western. The elimination of such a government ended (in theory) the Cold War, and afforded the chance for all nations to forge new, positive relationships with Russia and the former Soviet states. Regrettably, however, this chance does not seem to have been acknowledged or acted upon by the West. Russia and the West do, in many areas, have very different values, and between them there is a history of suspicion, rivalry, and bad blood. But simply being angry, holding onto old stereotypes, and refusing to move forward together is never going to create a positive result. Differences in opinion can never be solved with silence. Dialogue and respectful discussion is crucial if we ever wish to move past this uncertain state of post-Cold War hostility. As I have acknowledged, there are numerous differences in opinion between Russia and (as an example) the majority of the United States. Russia tends to be much more conservative, whereas America is a champion of progression and civil rights in the world. In the modern world there are generally certain attitudes which are held by a majority, but opposition to these attitudes is not inherently wrong or evil. I believe that the world as a whole, as well as every individual living in it, needs to accept that there will always be someone who thinks differently than they do. What matters is that we do not try to force our opinions inconsiderately on others, and that we ensure that our own opinions are stated with thoughtfulness and precision. The Cold War superpowers of Russia and America do, however, occupy common ground- a fact that perhaps we should consider more often. Both nations are combating terrorist powers and organizations which draw their inspiration from the same extremist principles, and as a result, both can work together to make the world a better place for all. I feel that Russia has always been the beneficiary of some unfair stereotypes and attitudes, encouraged, for example, by many a Hollywood movie. I wish that the West would see Russia’s many intricacies and strengths, instead of viewing it as an oppressive and backwards nation headed by a man who seems authoritarian and cruel. Every society in history, and most likely every society to come, has its own innumerable problems- that is the mark of humanity. Corruption, individualism to a detrimental extreme, disregard for others- these are all problems which we will probably face for as long as we inhabit the earth. But what matters is that, instead of harping on others’ problems, we actually address them with understanding and work through them together. No one likes to be preached to nor to be ignored, and it might do the leaders of every nation good to remember it. In closing, I lament the current state of distrust that not only America, but also the collective West, has for Russia. I also lament the fact that no country seems to be making an exceptional effort to fix this distressing problem. But I still have hope, and I believe that although Cold War attitudes may prevail in the 21st century, the chance that 1991 provided also exists still. Furthermore, international cooperation is not solely up to the leaders of nations. It begins with every individual, and we all have the power and the ability to see things in a different light, or to look at an issue with careful contemplation rather than immediate judgement. We should all realize that our opinions and choices will never be the same as those of other people, but that this doesn’t mean that we cannot all coexist and enjoy productive and smooth relationships. We are all human. We all fail. We all inhabit this world together, and we should never allow our differences to open too great a void between us. We are now one day closer to spring (in theory) and still, nothing has changed- it is around -20 degrees Celsius here in southern Ontario, and I am am still wishing for it to be summer. So here is another of my Polyvore creations, feminine and nostalgic, and perfect for the painfully distant summer!